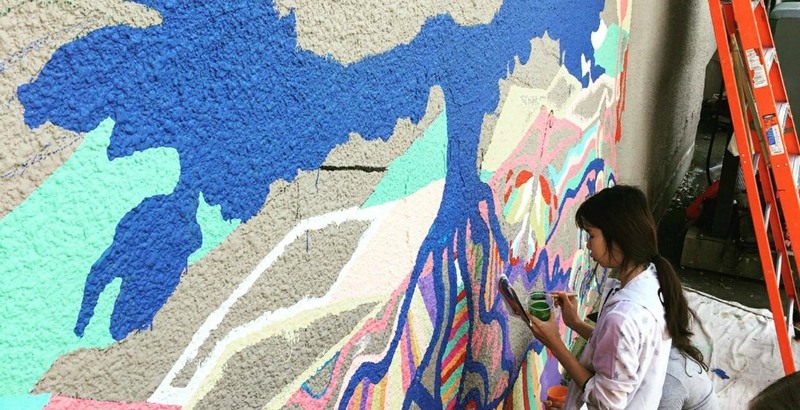 This year’s Vancouver Mural Festival will end on a higher note than ever before. Besides all the new murals (which also means plenty of photo opportunities) that have popped up in Vancouver’s Mount Pleasant district over the last couple of days, attendees will be able to enjoy two massive celebrations on Saturday, August 11 that close out the third annual festival. The epic street party in and around the area of Main Street and Broadway will return this year with live art, multiple live entertainment stages, multiple beer gardens, markets, street dance battles, graffiti jams, and more than 30 brand new works of public art. This will occur between noon and 6 pm. Main Street Main Stage (Main & 11th Ave): Acclaimed musicians such as Shamik, Schwey, The Belle Game, and Juno Award nominee Hannah Georgas. Grab a drink from Granville Island Brewing’s family-friendly beer garden adjacent to the stage. Treasures & Travels Market (Main, between 10th & 11th Ave): This has quickly become one of the most popular festival markets of the summer featuring vendors, artisans, and artists curated by local lifestyle bloggers, Treasures & Travels. Cardboard City (Main & Broadway): Paint your own mini-murals on this huge cardboard re-creation of Mount Pleasant. Aurora Oasis: Chill & Dance (Alleyways behind Main & 6th + Main & 10th): Aurora brings a bit of greenery by presenting our incredibly popular Oasis in two alleyways/parking lots for this year’s street party. Ice Cream Kingdom (Main & 10th Ave): A huge cluster of ice cream and dessert food trucks in one location. Back Alley Skate Jam by Antisocial Skateboards (Main Alley between 7th * 8th Ave): Skateboarding & Music all produced by the local institution/skate shop. 71/2 Avenue (New Mural Alley between 7th and 8th Avenue: This year’s festival focused a series of murals in an alleyway that runs east to west between Main Street and Jonathan Rogers Park. 4 Elements of Hip Hop Party (Main Alley at East 4th Avenue): Celebrate the 45th Anniversary of the birth of Hip-Hop on August 11th with street dancers, graffiti artists, emcees, and DJs. Then between 6:30 and 9:30 pm, the activity shift towards the nearby Jonathan Rogers Park for a concert by Live Nation, featuring Juno Award winners A Tribe Called Red, Charlotte Day Wilson, and Teen Daze. This block-sized concert at the public park is completely new to this year’s event, and it is a family-friendly event. Tickets start at $30 (kids 12 and under are free) and a four pack of tickets is $100.